The Heart Sutra is Buddhism in a nutshell. It covers more of the Buddha's teachings in a shorter span than any other scripture, and it does so without being superficial or commonplace. Although the author is unknown, he was clearly someone with a deep knowledge of the Dharma and an ability to summarize lifetimes of meditation in a few well-crafted lines. I would describe the Heart Sutra as a work of art as much as religion. And perhaps it is one more proof, if any were needed, that distinguishing these two callings is both artificial and unfortunate. Welcome to DharmaNet's Heart Sutra study center. We'll be offering Ashoka online courses, links to resources on the Web and special features relating to The Heart Sutra. Ashoka's getting started module introduces the Heart Sutra, its history, and background information on the setting and story it tells. This getting started module is not a line-by-line commentary but rather a prelude to the many voices we are offering. This getting started module is drawn primarily from Red Pine’s illuminating The Heart Sutra, as well as other contemporary and historical sources. Mu Seong looks to create a radical new understanding of an ancient teaching and to understand this core teaching of Mahayana Buddhism in the light of new perspectives on reality and a new model of the universe set forth by quantum physics. 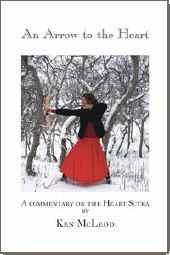 Coming soon on Ashoka, more courses on the Heart Sutra with Ken McLeod, Red Pine, Prof. Lew Lancaster and others. Ken McLeod's Heart Sutra commentary. to the Heart Sutra leaves you with nowhere to stand but right here." The Heart Sutra is a great torch that lights the darkest road, a swift boat that ferries us across the sea of suffering.